Our A3 wooden picture frames are high quality solid wood frames made in the UK. 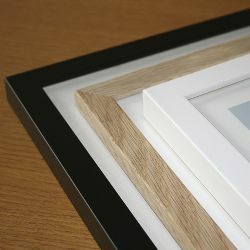 Our frames are available in matt white paint finish, matt black paint finish and solid natural oak. The painted frames are 25mm wide and the natural oak frame is 20mm wide. They are glazed with high quality float glass. These frames will fit an A3 (297mm x 420mm) print.